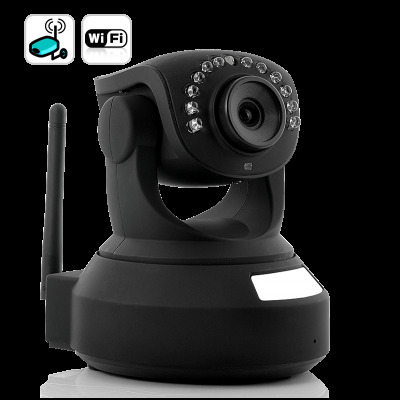 Successfully Added Premium H.264 Wireless IP Camera with Angle Control (Micro SD Card Recording, Nightvision, IR Cut, Two Way Audio) to your Shopping Cart. Wireless IP Camera with Micro SD Card Recording: The ultimate security camera that comes with H.264, IR filter, nightvision, motion detection, video recording onto external memory, mobile phone viewing, pan and tilt angle control, and so much more. Store countless hours of video files directly on a micro SD card up to 32GB (not included) with cycled recording mode and make sure to keep a track of all suspicious activity at your home or office. Once the card is full, it will automatically overwrite on previous recorded files so there is no worry to miss out any unforeseen event! Provided with an advanced IR filter, this awesome IP surveillance camera delivers great clarity and image quality. Used with our CMOS imagers, infrared (IR) cut-off filters produce accurate color images. With the help of this technology every detail appears so distinctly thus allowing you to easily identify people and recognize objects, even in environments with very poor lighting conditions. Once you are logged in, you can manage an array of functions and change, modify, implement, view, and do so much more than just sit and watch. This model provides true versatility in its applications with WiFi enabled and the additional option that allows this smart IP camera to alert you via email when the motion detection record function is activated. You can even pan and tilt the camera up and down, left and right to get the perfect view. Thanks to the night vision capability you can monitor and view your home or office any time, 24/7. The Wi-Fi feature comes with WEP encrypted security options, this helps in making sure your IP security camera system is protected from hackers. With the convenient mobile phone viewing feature, you can even be at your office, Starbucks, on the train, or pretty much anywhere and still have view of your security system to see what is going on at home. You can now truly say that you've got eyes at the back of your head. This powerful smart IP security camera with cycled recording, H.264, IR filter, night vision and motion detection recording is in stock now, and available to you at a factory wholesale price. Click "add to cart" now and we will express ship out your order tomorrow. Good for dropship sales as well as internet storefronts.